It seems that no magazine can go a single issue without a large piece on plotters, e-maps, rasters, vectors and other sunlightviewable wizardry. I still use a traditional paper chart and am most delighted with it in every aspect, and I wish to take the uphill position of pointing out the ways in which paper surpasses the electronic alternatives. A paper chart today is the most accurate navigational "plotter" available at any price. Let me point out why. First, technology is not confined to electronic charts. In fact, in the last few months we have seen a giant leap forward in paper charts, namely, the print-on-demand capability. It goes without saying that the most accurate chart is the best chart, and we also know that changes, both in navaids and in the natural world of sand, rock and onshore landmarks, are ongoing. This is reflected in the oft-repeated admonition to check your Local Notice to Mariners. You do check those, don&apos;t you, and correct your electronic or paper charts accordingly? Each paper chart, down in the lower corners, carries the date at which that chart was correct. When was your electronic chart last corrected? Now you can get a chart freshly minted that has every change and update on it. This will be, then, the most accurate navigational tool the world has to offer. Several sources of print-on-demand charts can be used, including Oceangraphix (877.562.4278) and NOAA (800.638.8972). I recently took a cruise through upper Chesapeake Bay to transit the C&D Canal on my way to visit the Cohansey River on Delaware Bay. I had replaced my paper charts in late winter, as I always do, so my No. 12278 and No. 12274 were neither old nor ignored. Nonetheless, a Local Notice to Mariners had stated that the entire upper bay was now rebuoyed/renumbered. So I ordered my first print-ondemand chart; the changes were neither small nor subtle. I also reprogrammed my GPS with the new reality. Before, No. 50 was the waypoint to reach my favorite weekend hideaway/swim hole (Churn Creek), but now No. 50 was way past the mouth of the Sassafras River! For the last several weeks, the talk in these parts has been how captains were baffled by these changes, no matter paper or electronic. Besides this major technological advance, paper has accuracy advantages over electronics regarding the matter of scale. For piloting purposes (in contrast to open-water), the scale to use is 1:40. The paper chart gives you bigger and clearer views of the world at this scale than any electronic version, if only related to overall size. Use 1:80 only if there is no choice in the scale. Once you have a 1:40 print-on-demand chart as your partner at the helm, you are working off the world&apos;s most accurate version, period. Your electronic screen is second best at its best. Nigel Calder has written several eye-opening pieces in the last year or two about the gap between the basic charting data accuracy and that of our GPS instruments. In short, the GPS is correct to the extent that it almost doesn&apos;t fit well onto present day cartography. For example, when the little electronic dot on your chart plotter puts you someplace, you are certainly there. Sadly, everything else around it may not be where it is! While there can be some value in the determination of latitude and longitude, while on passage, piloting by definition demands that you comprehend your location relative to your surroundings. The only real value of any chart is as a miniature of the world around us. To date, we have very few charts that allow GPS to realize its potential to us. Clearly, the chart is the weak link in navigation in this new century. Claims of the electronic medium include "compact," "convenient" and "space-saving." I will be the first to concede that the paper chart, without the necessary cutting and packaging, is none of the above. But I wish to share with you some new technology in the world of paper charts that I believe makes paper competitive with the mini TV screen permanently attached to your dash. While I have seen numerous products for waterproofing the conventional chart, and some chart books have reduced the overall size to be dealt with, I wish to present my own system, which has done well over a couple of decades. 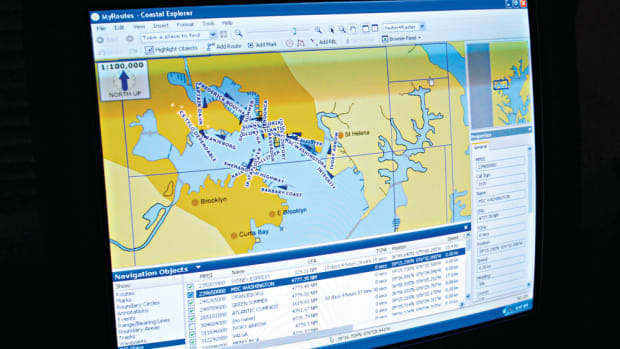 First off, nobody can cope with the nautical chart as it comes from the printer; it curls up, extends endlessly in every direction and won&apos;t fit on your dining room table, let alone your bridge. Further, it has vast areas of no interest or value to your particular cruising needs. Thus, every chart must be cut in order to be useful. For those of you who are reluctant to cut such an official document of unsurpassed beauty and breadth of view, I say "get over it." However, before you cut, you need a template! My template is plexiglass, which allows me to slide it over the paper chart in every fashion to view in advance the "chartlet" about to be born. It is shaped to perfectly fit its place at my helm. If you are wondering how to cut the template, don&apos;t worry, your boat will tell you. While at your helm, take cardboard and move it around various locations until you are comfortable with where a chart will work best for you. It should be small enough to fit close by, and large enough to hold about an hour&apos;s worth of chart. About 13 by 22 inches would be a general minimum. My current template is sort of trapezoidal, 8 inches on one side, 17 inches on the other and 28 inches deep. I spend some minutes studying every possible way of including what I need into a single chartlet before cutting. If course lines jump from one chartlet to the next, now is a good time to draw them-before I cut. This is also a good time to add labeling to the latitude and longitude lines so that they are clearly identified when the margins are cut away. And if a cut-and-paste job is in order to join two pieces of separate chart, I frequently tape them together to form a single, seamless chartlet that suits my exact cruise pattern. Once I have arranged the plexiglass template over the chart, I move it around to get as much information as possible: latitude and longitude lines, course lines and other useful data. Then I take a pencil and draw a border all around the edge of the template. The newly created chartlet is exactly what the doctor ordered. This manageable, already partly labeled little masterpiece is now ready for the second phase: "pre-navigation." Areas of the chart that are of concern because of depth should be shaded prominently with pencil or highlighter; courses you may need at both ends. I use the c--- format above the line (for course, as in c115) and d--- below (for the distance, as in d1000). By the way, for close-in navigation, if you put all your navigational units into yards, you will find surprising clarity, i.e., your speed is yards/minute (from TACH), distance is yards and chronometer (stopwatch?) is minutes. Solve the equation: Yards per minute equals yards per minute. Your chronometer&apos;s job is rather straightforward. With course lines in, distance and direction on each, latitude and longitude evident throughout, and shoals and various dangers and obstructions prominently labeled or otherwise highlighted, you are now near the end of phase two. The last layer of emphasis is the navaids. Getting your eye on the number of a navaid on the chart at 22 knots in a 17-foot whaler is virtually impossible, I found early on in my 20 years with it. I found some stick-on tabs in fluorescent colors, and I then used a heavy black felt-tip marker to write the numbers on them. This should work even better in a larger trawler&apos;s environment. You don&apos;t do every navaid, just the ones you need. The chartlet is now finished, with the possible exception of the addition of the yards (or miles) scale transposed by cutand- paste from the corners of the paper chart and Scotchtaped in a convenient spot to set up your calipers by, should you be doing distance work in the future. Your paper chart has now evolved to match the electronic claims of being compact, convenient and space-saving. But one more e-chart claim remains to be tackled: waterproofing. 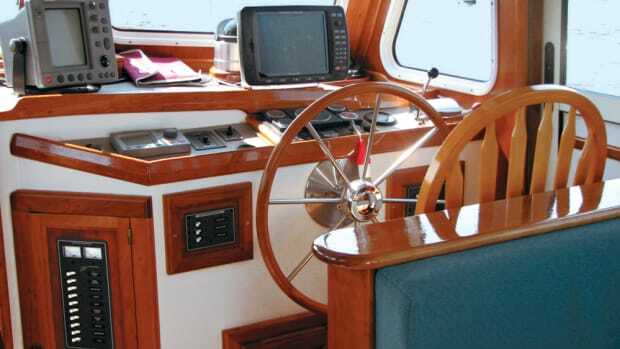 A case needs to be constructed to hold your prized collection of chartlets for easy carrying, either at home or into the motel to study overnight or even onto another boat. The paper chart, in its plastic case, is now the compact, convenient, waterproof and highly mobile navigational "plotter" you always wanted. If you take your template, in plexi or even in cardboard, to the local canvas shop, they can make your chartlet case cheaply and easily. I recommend the ez2cy brand for the front piece (but any soft, clear plastic used for enclosures will work) and either heavy truck-cover vinyl or double-layered 14- to 16- ounce canvas for the backing. It should be heavily stitched on three sides, leaving a "side door" open to slide chartlets in and out freely. This then is the perhaps our latest technologic marvel, the very handy "paper plotter." Oh, did I forget to mention, it has been "sunlight viewable" for several centuries now?